Remember the old How You Spent Your Summer essays when you returned to school in the fall? This is a variation -- pictorial style. On Friday, my husband and I set off from Albany, NY, for Rockville, MD, for the annual Christian Fiction Readers Retreat, organized by Annie of the Just Commonly blog and Carrie of the Reading Is My Super Power blog, where I was a participating author. We arrived at our lovely accommodations, the Hilton Garden Inn Friday at about 4:30. First up was a welcome and the keynote speech that evening from author Mary Connealy. We got to mingle and meet the readers and other authors attending after that. Saturday, we breakfasted, had opening prayer let by Debby Giusti and worship led by Rachel and Zach Dixon, and heard from featured speakers Dani Pettrey, Jen Turano, and Rachel Hauck. Interspersed between the speakers were games with readers, small groups, and author panels. I was on the A Bunch of Characters, where Bethany Turner, Janet W. Ferguson, Lindsay Harrel, Melissa Tagg, Toni Shiloh, and I answered questions as a character chosen from one of our books. I was Laurel from my sweet romance Sweet Entanglement. One of the scheduled participating authors was unable to attend because of a serious illness One of the attending readers made her this quilt. She embroidered the names of each of the participating authors on the quilt books. It was a a lot of fun. I think the readers enjoyed the retreat. It ended with a book signing and lots of "I'll have to come back next year." Have you every attended an in-person readers' event? Tell us about it. There’s nothing like a wedding to bring people together, but family dynamics can be complicated, especially newly blended ones. Sonja Cooper is thrilled that her daughter Lauren is marrying Jesse Brewster and giving her a ready-made granddaughter in the irrepressible 3-year old Shelley. The fact that Jesse is also Sonja’s business partner in the launching of the Morrison Mansion B&B is just a bonus. Custom bike shop owner Jeff Brewster is also delighted that his son Jesse is marrying Lauren and building a new family. The one awkward aspect is the unexpected attraction he feels towards Sonja. For although Sonja feels the same spark, having been burned in her divorce from Lauren’s father, she’s determined never to be dependent on a man again. Then the Indigo Bay Business Association pits Sonja and Jeff against each other by having their businesses compete for the coveted “New Business of the Year Award.” All’s fair in love and war, but hearts don’t always listen! What fun, Jean! Sounds like you had a memorable weekend. It sounds like a great event, Jean. 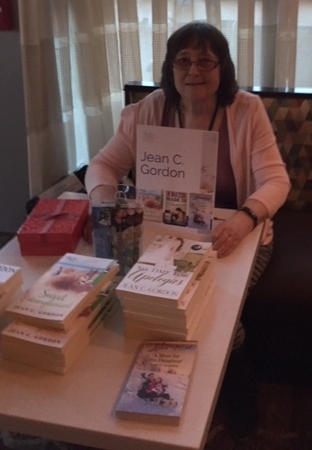 I'm so glad you were able to attend, and make memories with readers and other authors! Sounds great! I love the quilt idea.